Dr. M.Srinagesh is a post graduate engineer in Industrial Process Instrumentation Engineering.He obtained his M.Tech degree from Andhra University College of Engineering, Visakhapatnam. He is a Chartered Engineer (IETE). He has got 18 years of rich industrial experience in the field of Industrial Automation. He has been working as an independent consultant in the field of Industrial Automation and Calibration since 1999. Because of his flair for teaching he is also taking up teaching assignment in various private engineering colleges in and around vizag city. He teaches Electronic Instrumentation and Measurement subjects to ECE and EIE branches of Engineering. He is a member of various professional bodies like IETE, IEEE, Instrument Society of India(IISc, Bangalore),Indian Science Congress and ISA(USA). His papers have been published in journal for Instrument Society of India and other international journals. Currently,he is working as a Professor-Electronics in ECE department and Director -Industry Interaction & Research in PACE Institute of Technology and Sciences, Ongole. Indigenous Micro Controller based Bond Test Instrument for PSL industries Ltd, Vizag. (Used to test the Peel Strength of the PVE coat on Gas pipes buried under the ground. End Users: GAIL, RIL). Network Communication hard ware for the weighing instruments for Indian Metals and Ferro Alloys Ltd., Therubali, Odisha. LED street light electronic designs (LED selection and Driver design) for 3 I Technologies., Guntur. Energy Saving Corridor lighting unit (using photo and thermal sensors) for 3 I Technologies., Guntur. Wireless based Home Automation and Building Automation system (Under Progress). Designed Electronic Automation system for Community Toilets - Prototype design submitted to Dr.Ambedkar Foundation, Ministry of Social Justice and Empowerment- New Delhi. The Project details have been submitted for the nomination of Awards for Innovative Public Toilets (Rural). 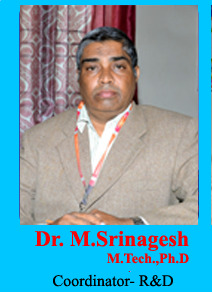 Present Position: Working as Professor ECE department and Director (IIR) PACE Institute of Technology and Sciences- Ongole. Oct,2012 - May,2014: Professor ECE Department, Universal College of Engineering and Technology, Guntur. Aug,2010 - Sep,2012: Associate Professor & HOD, EIE Department, Lakireddy Bali Reddy College of Engineering (A), Mylavaram (v), Krishna District. 2008 - Aug 2010: Associate Professor in ECE department, Kaushik College of Engineering & Technology, (a Pydha group of Educational Institution, Affiliated to JNTU-Kakinada), Gambeeram, Visakhapatnam. 1999 - 2008: Chief Executive, Leowei Systems ( A licensee of Department of Legal Metrology, Govt. of A.P. ), Visakhapatnam. 1996 - 99: Bellary Steels & Alloys Ltd., Bellary, Karnataka as Asst. Engineer (Inst.). 1994 - 96: Sathavahana Ispat Ltd. Bommanahal, Anantapur Dist. A.P. As Engineer (Inst). 1993 - 94: Narne Tulaman Mfg. Pvt. Ltd, Hyderabad A.P. as Engineer Electronics. 1991 - 93: Microcon Instruments & Systems, Bangalore. As Engineer-Projects. 4-Week training in Instrumentation Department, HPCL, Vizag Refinery during May, 1990. 3-Week Training from SIEMENS Ltd, Nashik Works, M.S. India. In PLC Panel Designs and Programming using Siemens Hard ware and Software Products during May, 1992. Training on Calibration Philosophy & Measurement Uncertainty conducted by Centre for Electronics Test Engineering, STQC directorate, DIT, MC&IT Govt. of India. Hands on training on Fabrication of MEMS sensors at IITB, Mumbai under INUP scheme during 23rdMarch,2015 to 27th March, 2015. Fellow (life) of Institution of Electronics and Telecommunication Engineers, India. FIETE (FL125943) & Chartered Engineer (C.Eng (IETE)). Member (life) of Instrument Society of India, Indian Institute of Sciences, Bangalore MISOI. (LM1570). Member IEEE MIEEE (USA) (Member ship No:90645771). Member ISA MISA (USA) [International Society of Automation] (Member ship No:33184777). Member (life) The Indian Science Congress Association, India. MISCA , (Membership No: L18153). Member (Life) Indian Society of Lighting Engineers, India (ISLE). To be a National level prominent research centre by nurturing research culture in the institute in the newly emerging and challenging areas of Science, Technology, Engineering , Mathematics (STEM) and humanities. Motivate the students and faculty of the institute to undertake research in the multi disciplinary domain to provide innovative solutions to the industry and society at large. To create awareness and opportunities in Research & Development among students and faculty to create a dynamic and vibrant research environment in the campus. To motivate the faculty to take up research projects, research publications and improve their knowledge, skills and qualifications by registering for Ph.Ds. To undertake research activities for the projects funded by agencies like ISRO, DRDA,DST,AICTE, UGC and other corporate.